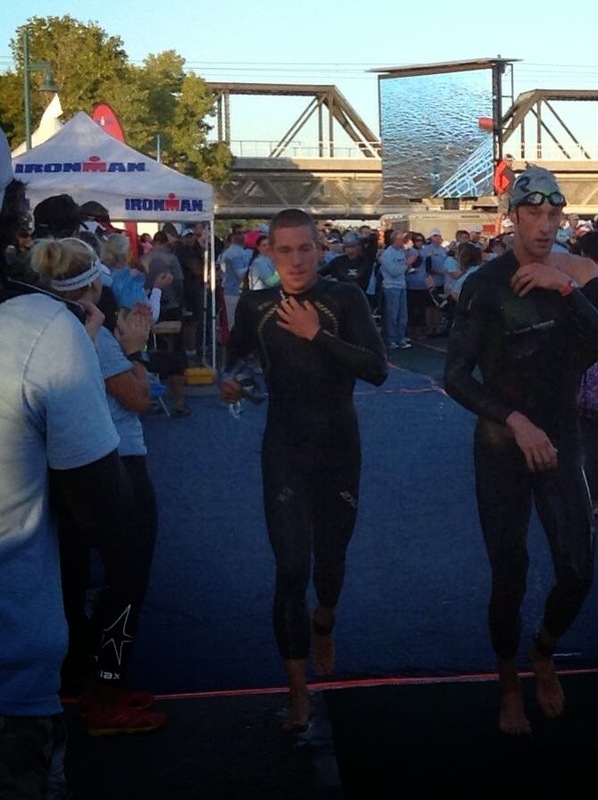 Swim (53:49): One of the EMTs was late to the event and thus we were delayed getting into the water. Normally we hop in around 6:30 but we weren't allowed in until just after 6:40. I was the first one in the water and I was surprised that I was also the first one to swim the 200+ meters to get to the start line. Usually there is some turbos that come flying by. My initial plan was to stick far right. I started there the previous year and it worked out real well, but the announcer Mike Reilly, and the support crew on kayaks, was telling everyone to start left. I was confused on why they were telling us that, but everyone seemed to be shifting to the left and I followed suit. However, instead of finding myself next to guys I wanted to swim with, I found myself next to guys I didn't. It was too late, the gun was about to go. The gun fired and the sloppy mess of strokes and contact started immediately. It was absolutely brutal, by far the most violent swim of the year and I wasn't getting anywhere in it. Mentally I had prepared to be aggressive but these people just seemed to want to waste energy instead of conserve it. At one point I took a look back and it seemed like I was dead last at the 200 meter mark. I also saw a nice big group that had formed far to my right and was now about 50 meters ahead. Although there is always safety in numbers I decided to leave the comfort and safety of the pack and veered at a 45 degree angle to the right. At the time I was thinking, "what are you doing", but I swam hard and the gap was falling. I kept swimming and told myself I had to catch that group - that was my race. After a few hundred meters I did the unimaginable, I had clawed on to the back of the train. I rewarded myself with some rest and recovery from the surge it took. To my surprise I wasn't overheating like I normally do after such a high effort. After a bit of recovery I continued clawing forward. After a few hundred more meters I found myself sitting at the front behind the lead swimmer, and in between the two swimmers directly in front of me. 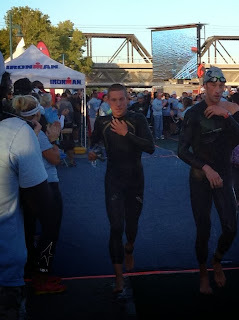 I knew the swimmer ahead to the left was fellow Illinois pro Jared Milam because of the sleeveless wetsuit he had on, and I knew the swimmer to my right was Trevor Wurtele because I could read the number on his cap. I was exactly where I needed to be. From there on forward I just took it easy. The pace grew a little weak in the middle portion of the swim but I wasn't going to waste any energy in moving the group forward a little faster. I exited the swim with guys, or ahead of guys, that had been handing it to me all year. 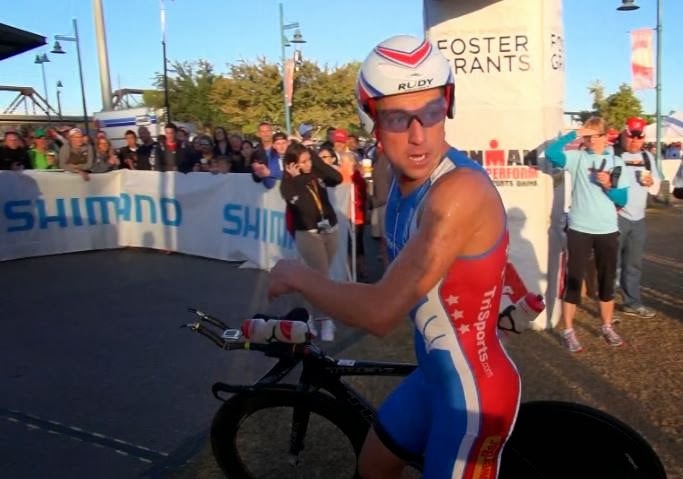 Bike (4:20:35): With so many guys coming out at once I wanted to make sure I had a quick transition be the the first one out of T1. 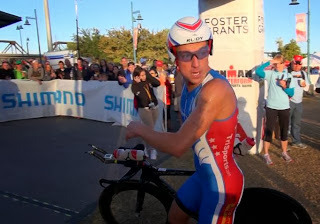 Coming out of T1 someone told me that Jordan Rapp was only 30 seconds up. I took a quick look and saw Trevor Wurtele making haste and decided I would gamble early and see if I could get a visual on Rapp. In retrospect it was a match that didn't need to be burned, and I would have loved to have that one back. After wasting that match, I held back and waited for the others to catch back up. For the first 25 miles it would be myself, Trevor, and Jonathon Shearon trying to string out the riders and make them suffer. A few more matches were burned, a few guys got dropped and I put the matchbox away and let Trevor do most of the heavy lifting as we completed lap 1. On lap 2, Victor Del Corral (eventual winner) must have grown leery of trying to ride in the back of a group and the natural accordion effect that starts to occur as we pass age groupers on their first lap. 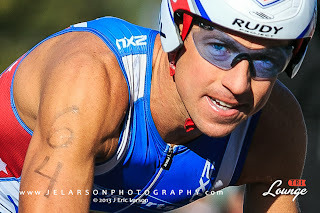 He moved to the front and I was happy to have to two pre-race favorites pushing and dictating the pace. I myself also wanted to stay at the front so I wouldn't have to burn any more matches closing large gaps that can occasionally open up. Lap 2 is also where we started to catch some of the swimmers who got kicked out of the lead group. This always presents a problem because they almost always want to latch on to the group, but 4 out of 5 times they quickly decide the effort is too great and drop off. It requires a delicate balance to recognize a rider who is jumping off the train and giving the train too much ground that is left to close. I haven't mastered the process yet and I still seem to burn mini-matches in the process. On to lap 3 and the time gap to the lead pack was quickly coming down. Jordan Rapp had made his way to, and completely passed the front group. Pedro Gomes was the only one not to be decimated by Rapp's pace and sat in 2nd. 5 miles into loop 3 and we picked up and spit out the lead swim group. That lead group included: Matty Reed, Joe Umphenhour, and ITU speedsters, but Ironman rookies, Matt Chrabot and Ritchie Nicholls. In the process I noticed that we had completely cracked most of our own initial group with the exception of Denmark's Jens Petersen-Bach, who I knew was riding a very smart race and would finish 3rd. I was running ok but I didn't have that snap, snap, snap in the legs that I'm still trying to find. Although, I did do a good job of staying cool, keeping hydrated and fueled up. It was 1x gel every 3 miles, with some cola in between and a salt pill as well. Towards the end of the first lap Matt Charbot made the pass and I fell to 9th. Onto lap 2 and the crowd support was there as always. I saw TJ Tollakson who reminded to increase my cadence and lift my hips. I did the best I could in kicking over the feet and clawed my way back to repass Charbot and back into 8th. 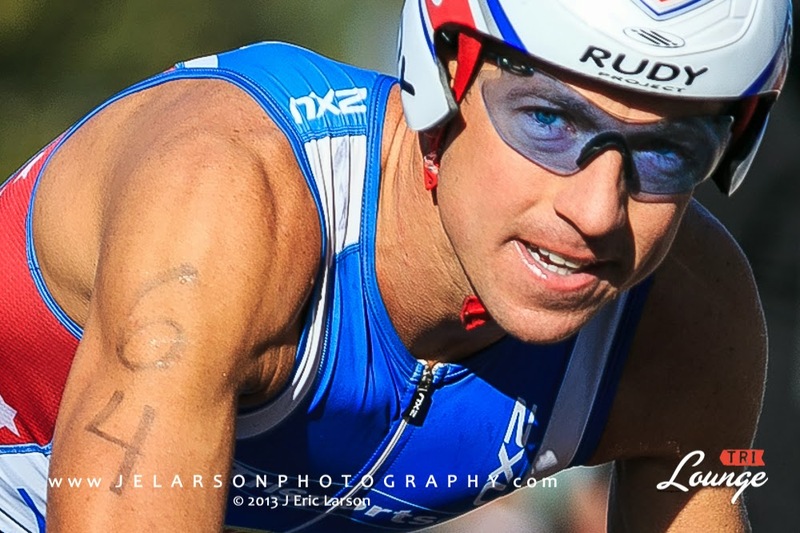 I would run in 8th giving it everything I could until friend and fellow American Matt Russell made the pass for 8th. I tried to go with him but I only lasted 200 meters and I knew my day was done, it would now be to get to the finish and focus on 2014. Along the way I got passed by a few more guys and would end up 12th but mentally fueled for 2014.
that I would have loved to have back on the run, but overall I can't complain. I went in knowing I was going to go for it on the bike and I did just that. I was super stoked with the swim and the swim progress I made. Some others said the run form looked better too which is a step in the right direction. I am also stoked that I was able to keep the bike at the highest level ever - 3 watts more than 2012 - while only having 5 TT rides since mid-September. It is exciting because it means I can keep getting the majority of miles from bike commuting and that keeps one less car off the road!!! All the volunteers - Ironman would never be possible without the countless number of volunteers who take time from their busy lives in order to help put on this great event. All the Ironman officials - for giving us the cleanest race we could have. 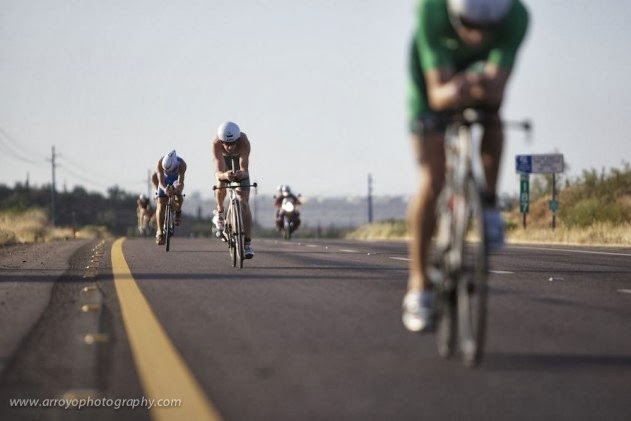 Trisports - for all the great tri gear you carry and for providing it in the most earth sustainable way. 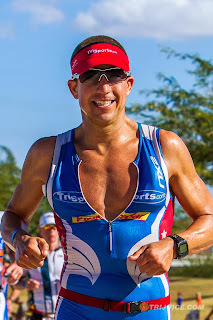 You can always help support me as an athlete by using my 20% off coupon code for Trisports that is tied to my name. Each code is unique for you so please contact me thru the above "Contact" tab and I will email you back the 20% off code. Codes can be used at anytime - no waiting for a special sale. They expire 12/31/14. Please remember to fill in your email address so I can reply back to you. If you don't provide an email there is no way for me to contact you. You can also tweet at me or message me on Facebook if you prefer. 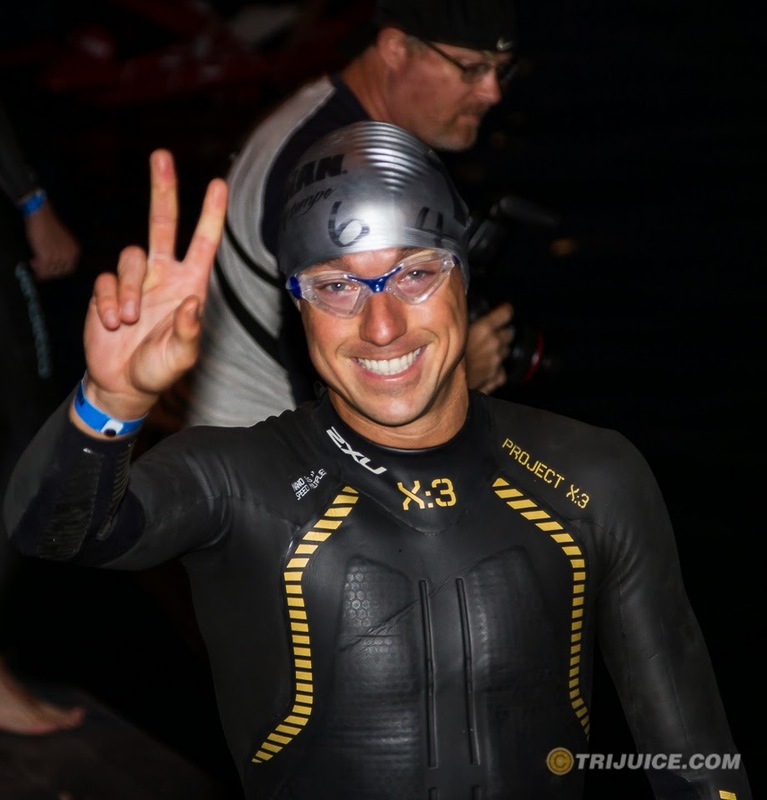 2XU - for your wetsuits, compression gear, trisuits and everyday training gear that rocks!! 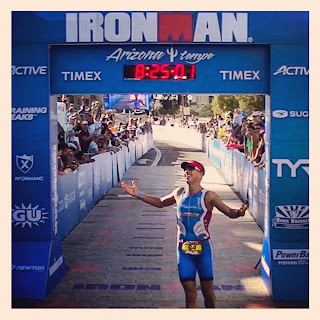 Thanks for your support since my days as an age-grouper. We have come along way since then. Atomic - for your endless pursuit of all the engineered "free speed" I can get on the bike. Your specially coated chainrings, cassettes, and chain, along with wheel bearings upgrade and special derailleur pulleys give me that extra special advantage over my competitors. 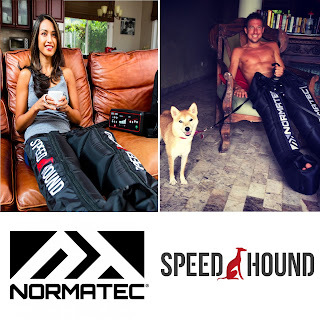 You to can get some engineered "free speed" and save 10% in the process by using coupon code "TG-10" at Atomic. Cobb Saddles - for allowing me to stay aero and keep my bum comfortable for nearly 5 hours on the bike. Your saddles provide the foundation for every bike ride I take. Proactive PT - for keeping me injury free with Gua Sha and massage work. I would have never made it to the start line healthy without your help. 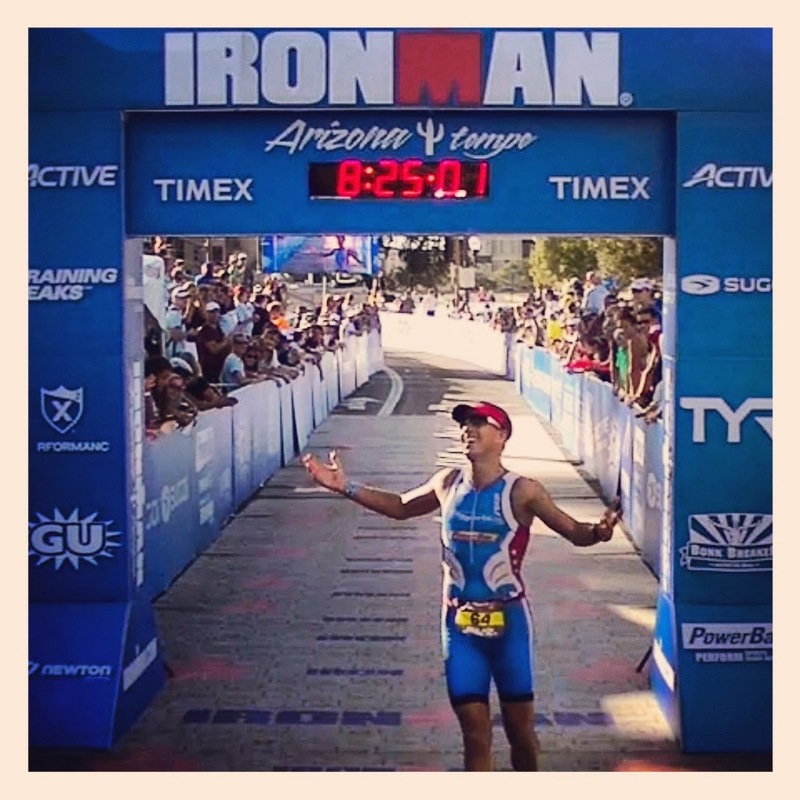 Steve Schwartz - for your continued support of my training, racing, and overall well-being. If you need a great Realtor in Madison, WI please consider Steve. Nick Morales of TriJuice - for capturing all the excitement that comes with an Ironman. My competitors, for challenging me and giving me the drive to get out of bed every morning and work towards being the best athlete I can be. Without you I would never be the athlete I am today. Nice read and great season Thomas. When you mentioned the run advice TJ gave you, what does "lift the hips" mean? You always want to run tall and lifting the hips is critical to making sure that happens. so does that mean rotate forward? can you describe where are hips are when you run tired and where you want them to be? Russ, it important to run tall, I just often think of the hips when trying to do so. What you are trying to do is stand erect so ideally, no your hips are not rotated very much at all. Sometimes when you get tired you have too much of a forward lean and too much hip rotation and that is what I am trying to avoid. OK thanks. Sorry about my late reply. For some reason I don't get an email that you responded and then a few days later I'll remember I asked you a question. Thanks for being informative with your replies.